finished a 7 month old calender project and made reusable snack bags. I didn't make these to save the planet or anything, I made them because they were darling and I hate wasting, and while sometimes a Ziplock bag is the only thing that will work, they are often wasteful. But most of all, I made them because I could. It all started when I saw this post back in January. Obviously, I needed Welly Warmers but first I needed Wellies! I then proceeded to learn that Wellies are a) expensive and b) won't fit my generous calves. Imagine my excitement when I saw these darlings at the scary Goodwill this afternoon. The tops looked big, like they might actually fit. Since we are close friends, dear readers I will tell you the awful, gross truth. I put my bare foot into a dark hole of a boot shaft in the scary Goodwill. Thus we see I am a) a dedicated bargain hunter b) a fool for style c) very brave and d) awesome! They fit. I paid for them by the pound, about 5 bucks or so. Now we will begin the hunt for the perfect flannel or flannels to make Welly Warmers. Muddy Oregon winters prepare. Are you ready boots? Start walkin'. We have reached the point in Embroidery class where we stitch and chat for a period of time. The girls know the basics now and are diligently working on their projects. Today, in conversation I mentioned Anne of Green Gables and the majority of the girls looked confused and said "Anne what?" The girls didn't know who Anne of Green Gables was. A quick consult of the local library database proved that Washington County Libraries do not have enough copies. They had some but not enough for a system with 13 branches. All copies were checked out. So I rummaged through my boxes and my shelves and came up with enough copies for all. They were sent home with my precious volumes and a vow, literally, to be well into the book by Tuesday. Anne has now become required reading for embroidery class. How could we proceed with out a basic common background? We can not. Anne Shirley is essential to Beginning Embroidery. I am dead serious. Next month's knitting students had better prepare. Last night Moose and I had an impromptu mini date. We watched a movie TOGETHER (that almost never happens) and ate my new favorite treat, homemade popcorn with Swedish fish, a happy by product of Cinema Domingo where the Swedish fish and popcorn mingle in the same bowl. We drank pulp-free lemonade. The movie was decent. We had so much fun. In other news, the neighborhood kids caught a garter snake. Yesterday must have been the single most terrifying day of "Lightning's" life. The day he was caught and manhandled by 11 wild children. His terror continues. Boba Fett was bitten, he didn't even care. I am teaching embroidery classes again. The Miss Moss School of Needlework for Young Ladies had 5 students with quick little fingers and next month I will be teaching knitting and will be fielding about 12 little darlings and their needles. In preparation and for inspiration I have been stitching some mini quotations. "All is well" is my new "word of the year." It is what I say to myself to help me carry on. A watchword. The other is for my dear friend who may or may not have been mentioned on this blog many times. She has always said "Good friends lie to each other." She doesn't mean awful, terrible untruths but the lies that spare peoples feelings like "Yes, I think Methuselah is a great name for your baby!" and "No, that dress does not make you look like a tomato, a big fat tomato." Samurai Mom is, as you know, honest as the day is long. I always tell the truth, I volunteer truthful information un-solicited. My honesty will get me into trouble one day. Once I even pulled myself over for speeding in a school zone, the police man kept on driving. I do not cotton to the "Good friends lie to each other" philosophy. The other day my dear friend told me that she had "told a fib" to her neighbor concerning good neighborly relations, which was a lie. A lie! I did not condone the lie. The next morning my dear friend me she was basking in cosmic irony and her new watchword is "One should not tell lies." The neighbor had to be told the truth the next day. Egg, meet face. The situation that it reminded her of a line from a book "Lies, wicked lies." I stitched that darling motto up while we chatted on the couch. Note the tangled web. If you would like me to stitch a small watchword to remind yourself of folly or courage just drop me a line. Our beautiful World: I think my potato plants are so beautiful. So green and leafy, and last year when I harvested the potatoes, it was like digging buried treasure and they lasted most of the winter. Blessings: My little garden. Didn't plant until well after Mother's day as we had just moved in. But Moose made it a priority early on. We used the boards from our old garden boxes at the other house. I already had all of the seeds. The cost was $38 for 20 lags of soil. With the rotten spring weather we aren't that far behind everyone else. Striving For: The strength to endure. Praying that the old house sells. We hit the beach twice this week. The first day was so-so and we had to leave early but yesterday we fled the heat and went to our favorite beach. Camrock was on a mission and he set right to work building a model of the battle at Omaha Beach. He made waves with the tip of the shovel. Speaking of shovels we found this amazing shovel that is just about 2 feet tall and very light. I feel it will become a good friend if we can manage not to lose this one! I was exceptionally brave, I played in the cold water with Boba Fett and at the tide pools I picked up 2 hermit crabs because every one else was too afraid. Not to mention posting a picture of me in a bathing suit on my blog. I asked Boba Fett to put his head close to the rocks for the picture. he is so funny! The weather was so fine, the sky was clear, it was the perfect day at the beach. And when we got home it was the perfect night to sit on the porch in the twilight. I have a goal to have a library of 1,000 volumes, I have blogged about this before. Most of my books are selected because I have read, want to read or should read the books. Some simply look useful to me as they sit on the Library book sale table. I scout out the classics and books that teach skills and I collect authors like Pokemon cards. I hate omnibus books that cram all or most of the works of one author into one volume. They are so unweildy and heavy. It is SO hard to cuddle up with The Complete Works of Shakespeare. A small part of my collection is made up of foreign language books. They were free and I had heard the titles before and I though it would be nice for when I dust off my French and want to read a novel or when we learn to speak Spanish even though I LOATHE the language. You may mock, but when the apocalypse comes I won't have to depend on bookstores or a defunct county library to keep my mind busy. La Keira was helping me sort out my books onto my shelves when I told her about my small foreign literature collection. A while later she said "Wow, it really is ALL in Spanish." I looked up to see her holding my copy of Charlotte Bronte's Shirley. Puzzled "I said no, that's Shirley." proudly remembering the triumphant day when I found the LAST of the Bronte books at the Library sale and in nearly mint condition. She flipped it over the the back cover and passed it to me where I read "Escrita tras el exito revelador de Jane Eyre, aunque en circunstancias ciertamente tragicas, mientras veia morir a tres hermanos...."
The only words in English are "Shirley" and "Charlotte Bronte." which are the only words on the front and the spine, which is all I looked at having read the book previously. Lucky thing it wasn't Villette which I read with my French dictionary in my lap to translate. Do you think they leave the French in or translate it all to Spanish? 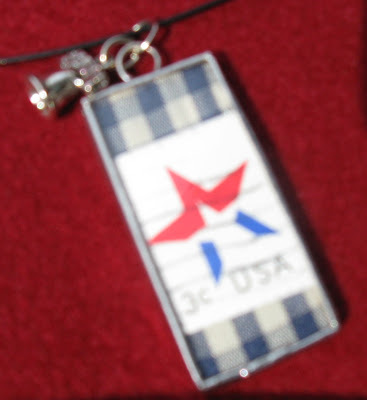 I have always wanted a piece made by Susan Miller. I first saw her jewelry in the gift shop of the Conrad Mansion where I was a tour guide. Later she opened Sassafras, an adorable artists co-op in Kalispell, Montana. My mom is part of the co-op so I started to get to know Susan a bit. Still, I loved her work but never made the leap to buy a piece of jewelry. There wasn't really a reason it was just I would love the stamp but want a pin not a pendant or want a pendant and not a pin. I would like the shape but not the stamp, always there was an excuse. Really, 14 years is long time to wait. But now I wait no more because my mom gave me this for Christmas. I had to hold back the tears. It is so perfectly me. My friend gave me the little liberty bell a few years ago and I just couldn't decide what to do with it. 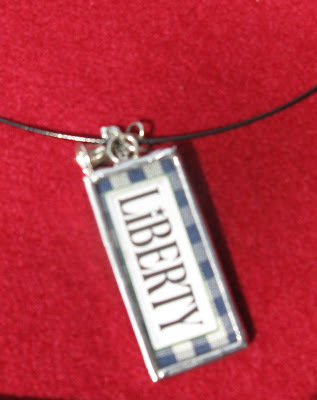 When I went to place the Liberty necklace in my jewelry box I saw the bell and knew where it needed to be. It was the perfect accessory for watching the fire sparks at Oak Hills this year. Thank you everyone for voting. Before the poll I was having a tough time deciding between "Providence" and "Starlings." and now after the poll where "Starlings" and "Providence" recieved the same amount of votes I still can't decide. I am glad that my readers and I have the same level of indecisiveness. However, I did notice that I kept rooting for Starlings each time it fell behind Providence during the voting. So I am thinking "Starlings" might be the winner. I even wrote it in sharpie on the bottom of a traveling laundry basket as a tentative stamp of ownership. And then, yesterday, my friend Margo had a great idea for a name for my house. "Primrose." Oh, Snap! So, yeah. Providence, Starlings or Primrose?